Traffic Door Selection: Rapid Roller Doors or Strip Doors? There are numerous factors involved in selecting the right traffic door for your facility and if you are buying new doors for a whole facility it is a considerable investment. This comparitive overview of two popular high-traffic doors will help you invest wisely. While speed of operation is often a major driver for considering high-speed doors, reliability, a tight seal when closed and in some doors, self-repairing features are also crucial. 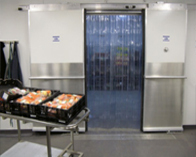 Unfortunately, in many industries, rapid roll doors have become a byword for exorbitantly high maintenance costs and downtime, due to selection of cheap, poor quality doors. In many cases, the total-cost-of-ownership of the equipment is many times more than the initial purchase value. That's why it's critical to consider the potential on-going costs associated with each high speed door before you make your decision. The operational benefits of rapid roller doors (speed, hygiene, energy and temperature control), can quickly be erroded by high cost of operation, downtime and production loss if a poor choice is made at the time of selection. Is this doorway to provide a barrier between two zones? Do you need to keep doors closed to meet hygiene requirements? Do you need a tight seal between the two areas the door segregates? Do you have a capital budget allowing $11,000 + per door? Does it have a tight seal? The door roll should be covered by a fascia and rear hood and guides should tightly seal to the curtain. Will it function in your environment? 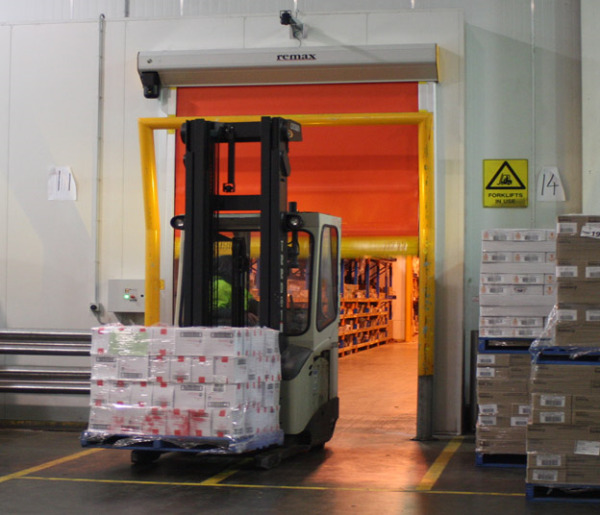 Make sure the door is made for the conditions of your warehouse environment. For example: if you need it for cold storage make sure it is designed for that, if it is being used in a hot climate make sure it can handle the heat. With these two checklists in mind you should be able to choose the right roller door for your facility. If you answered no to any of the questions above, you may wish to consider a Stripdoor as an economical alternative to high speed doors. Stripdoors can be made to fit any size of doorway. Whilst door size may limit some Rapid Roller Doors, by contrast Stripdoors can be fitted to any opening; large or small. A high traffic doorway. Strip doors are a cost efficient option for many types of traffic. Beware that if personnel are using them, incorrectly specified strips swinging may cause irritation or even harm to those using them. A robust barrier that does not need to be airtight. Strip doors create a barrier against airborne pests and also help with temperature control but won’t keep a completely airtight seal. Low cost. If budget is a restraint, stripdoors are a fraction of the cost of automatic doors. Consider however, that they're like tyres on your car; -the more you use them, the sooner they'll wear out and require replacing. If those criteria fit your demands then strip doors are worthy of your consideration. If you would like more information on strip doors or PVC doors then you can review your options here, or if you are sure a rapid roller door is your door of choice and you would like a comprehensive selection guide please click on the link below to download our free ebook.